Turkey is most definitely not just for Thanksgiving! If you've never enjoyed a good smoked turkey, you don't know what you're missing. Below is my method for bringing a little of that Thanksgiving love to your table, even in the heat of the summer. Click the picture to get a closer look. Submerge the turkey, breast end down, in the brine and cover the bucket with foil. Wrap the bucket with old towels, or (even better) a sleeping bag. Let the turkey brine for 8-12 hours. Important: The bird must be kept at 40º or colder at all times, so monitor your ice and add more as necessary. Remove the turkey from the brine (gently) onto a large sheet pan. Let the turkey drain about 20 minutes. Smear the entire surface of the turkey with the oil. Sprinkle the entire bird with a moderate coat of the seasoning. Add your favorite smoke wood chips (soaked) or chunks to the coals (I recommend cherry or apple). Oil the grate of your grill/smoker. Cook the turkey indirect until the thickest part of the thigh reaches 165º (about 3 1/2 to 4 1/2 hours). 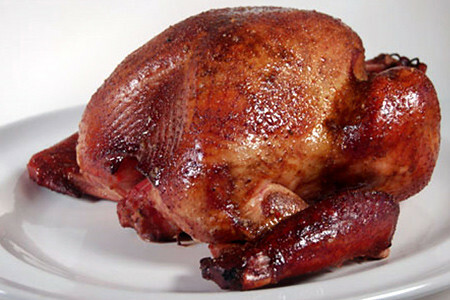 Remove the turkey from the grill/smoker onto a platter, tent it with foil and let it rest for 20-30 minutes. Gaspare - Yes, 3 1/2 - 4 hours of cook time, not brine time. BTW - I'd recommend my Ultimate Thanksgiving Turkey Brine. I have smoked many turkeys at about 200 - 225 degrees, and cook for 12+ hours till it's at 165. I do stuff with large chunks of apples and onions to keep it moist. While I have always received compliments on all my smoked meat, I have been told by a few people that the turkey is their favorite. Oh I use a UDS (ugly drum smoker) if that makes a difference. Gaspare - You can cook whatever size bird will fit in your UDS. I prefer smaller 12-14 lb turkeys. Do you think two 14 lb turkeys would fit on a 22.5" grate? Uh, no way. My UDSs have two racks. u are able to "stack"? I don't know if my UDS would have enough clearing since I have a flat top. I'll need to see if I can find the dimensions for a 14lb bird... TY again! Thanks for the recipe. I am using the ultimate brine...do you still use a rub with this or will that add too much flavor? Thx! Yes, I give the bird a hose down with canola oil and dust with a little rub of choice for color.